The Rt. Rev. Dr. Felix Orji, OSB and his wife, Lilian. Welcome to the Anglican Cathedral Church of St. Francis. As the Bishop of Diocese of the West, I am proud that St. Francis is the Cathedral Church of the Diocese. This church is the seat (cathedral) of the Bishop, and is my home church as well as the headquarters of the Diocese. Even though my duties call for much travel within the Diocese and all over the world, I do have occasion to attend services at St. Francis Anglican Church and I often celebrate and/or preach at these services. Hopefully, I will see you in our Cathedral and have a chance to visit with you. St. Francis Cathedral Church has a wonderful history. It is a pioneer church within the CANA (Church of Nigeria) and ACNA missionary bodies. Of note, our Cathedral Church is part of the CANA Diocese of the West, but it has deep roots within ACNA since our Diocese is a Diocese within ACNA. These affiliations make our communion with the Anglican Communion much stronger, and allow us to continue our sustained legacy of adhering to God’s true Word written in the Bible and fully revealed in His Son, Jesus Christ. At St. Francis Cathedral we are committed to walking together as brothers and sisters and more importantly we are committed to Jesus Christ as our Savior and Lord through whom alone salvation is possible for anyone who trusts Him. I hope you find the perfect place for you and your family at St. Francis Cathedral. If I can help you in any way, please contact me. May God bless you and keep you always. Bishop Felix Orji is the Diocesan Bishop of the Missionary Diocese of CANA West, which is part of the Church of Nigeria(Anglican Communion) and the Anglican Church in North America(ACNA). The Diocese of CANA West comprises parishes in the United States and Canada. There are more than 30 parishes and 70 clergy in his Diocese. Early in his life, Bishop Felix Orji made a decision to follow and serve Christ as the Savior and Lord of his life. The result of this decision as a teenager was a commitment to the call of God on his life to serve Christ as a minister of the gospel of God’s grace. This led him to ordained ministry in the Anglican Church in Canada and in the USA as a priest and now as a Bishop of the Church of Nigeria and ACNA in the Anglican Communion. He completed a BA degree with honors at the University of Ife in Ile-Ife, Nigeria, and received a Master’s degree at the University of Lagos, Nigeria. He earned a Diploma in Christian Studies from Regent College, Vancouver, BC, and a Master of Divinity from Vancouver School of Theology in Canada. Dr. Orji also earned a Doctorate in Leadership and Evangelism from Gordon-Conwell Theological Seminary at the Charlotte, North Carolina campus. Bishop Orji, currently the Bishop Protector of the Order of St. Benedict, was ordained in 1996 in the Diocese of New Westminster, Anglican Church of Canada. He served his curacy at All Saints Anglican Church in Burnaby, BC and afterwards as Associate rector at St. Johns Shaughnessy in Vancouver, BC, the largest evangelical Anglican parish in Canada. In 2004, he moved to the Diocese of the Rio Grande in the USA where he served a parish for a year. He was also the Coordinator of the Anglican Fellowship of the Southwest until 2010. That original effort led to the formation of the Diocese of the Southwest. In 2005, Dr. Orji became associate rector of St. Francis on the Hill in El Paso, and Rector from 2008 to August 2015. In September 2011, he was consecrated Bishop by the Anglican Church of Nigeria(Anglican Communion) to serve in the USA and Canada. Bishop Orji is now the episcopal head of the Anglican Cathedral Church of St. Francis. Our Bishop’s vision and prayer is that the Holy Spirit will make it possible for us to go DEEPER with God, get CLOSER to one another, and go FURTHER in our impact in our community and the world. 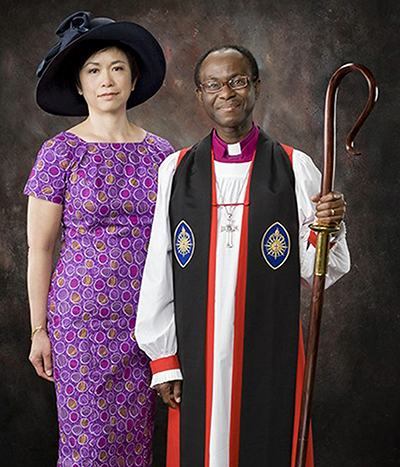 The Right Reverend Dr. Felix Orji and his wife Lilian have four children, Cara, John, Jadon, and Justin. Cara is a graduate of Johns Hopkins University and currently at Texas Tech School of Medicine BioScience studies. John is a Computer Science student at University of Toronto in Canada. Jadon is an Engineering student at University of Washington, WA, and Justin is in high school.